By the time Sharyn Scott-Olson had reached the crime scene, she already knew something was seriously wrong. The three-block area surrounding the construction site was empty except for three police carts, five officers, and Petros Batson. Petros stood at the edge of the site, staring down the street, obviously waiting for her. His long coat brushed against the rust-colored Martian soil, and his boots were covered in dust, making them look pale orange instead of black. There were no Disty. Not on the streets, not leaning against the doorways in the nearby buildings, not guarding the site, even though the excavation equipment was clearly Disty-made. The Disty had fled, and that made a shiver run through Scott-Olson. She knew that the Disty didn’t like death. One of the many reasons Disty vengeance killings worked in Disty culture was because the Disty believed that dead bodies contaminated the environment—not just for the moment those bodies touched the ground, but for all time. But the Disty also valued their homes, their businesses, and their possessions. 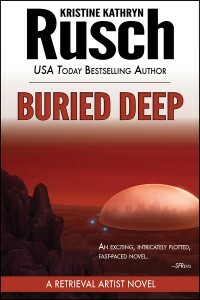 Scott-Olson had entered hundreds of locations in Sahara Dome, always to examine a dead body, and never before had she arrived at a scene without at least one Disty there. Usually the Disty was a member of the Death Squad. Scott-Olson had never been to a scene so unclean that not even the Death Squad would stand guard. The surrounding neighborhood looked no different than it had ten years before. The buildings appeared haphazardly built, although they weren’t. Their doorways, tiny by human standards, were made for the adult Disty. There were no windows. The buildings seemed to grow off of each other. Only one open street went from block to block, and that was a nod toward the initial human requirements of Sahara Dome. Most of the streets, especially in this section, were little more than tunnels, with buildings on top that stretched all the way to the Dome roof. The tunnels were so low that no adult human could walk through them without crouching. The walls were narrow as well. Humans who lived on Mars learned to stay thin if they wanted to travel inside the Domes. Heavyset humans sometimes couldn’t fit inside the tunnels at all. Scott-Olson was too thin, but sometimes even her arms brushed against the walls of Disty tunnels. She was lucky she wasn’t claustrophobic, since her job often took her into the Disty-only sections, where the tunnels seemed even narrower. Perhaps what surprised her most about the crime scene was that it wasn’t narrow or covered with buildings. It was the widest open space she had ever seen in the Disty section. An entire human-sized city block—perfectly square, just like the blocks in the human section of the Dome—had been torn down. Someone had removed the Disty brick, and piled it against the back side of the square as if building a wall. Scott-Olson looked up, saw the yellowish light on the underside of the Dome, the shadow of the inexorable dust on the top of the Dome, and the darkness beyond. Even though she had been here for nearly twenty Earth years, she still couldn’t get used to the darkness. She used to imagine that she’d leave before the next winter set in. She had no such illusions now. “It’s about time,” Batson said as he walked toward her. He looked gigantic against the twisted Disty buildings and the tiny carts. His long coat swayed behind him, creating eddies of reddish dust. She had forgotten how ubiquitous the dust could be inside the Dome. The Disty had developed an excellent filtration system to keep the dust outside, and almost all of the Dome’s interior was paved. Except when buildings were torn down, and construction was underway. Batson even had dust on his face. His dark skin seemed unusually ruddy, and his eyelashes, long and beautiful, accenting startling green eyes, looked like they’d been coated in red dye. He grunted, shook his head, and then took her kit from her. “Where’s the Death Squad?” she asked. He looked at her sideways as he led her to the construction site. “We’ve got a major contaminate, as far as they’re concerned,” he said. “Major contaminate?” In all her years as medical examiner for the Sahara Dome Human Government, she had never heard of anything categorized like that. “The body’s human,” he said. She had figured that much. Otherwise, she wouldn’t be on the scene. The Death Squad dealt with their own in this section of the Dome. She got Disty who died in the human section, and had learned to perform Disty autopsies because the Disty were so squeamish about doing one themselves. “I’ve handled human bodies in the Disty section before,” Scott-Olson said. “Not one like this.” Batson stopped at the edge of the construction site. There were several large dips in the sand, caused by the weight of the buildings that had been on this site. She counted five separate rectangles, and stopped when she realized she couldn’t take in the entire leveled area. She scanned the site. Aside from the Disty excavation equipment—something that resembled a miniature backhoe, a claw-shaped digging something-or-other, and a tiny truck that carted the recyclable building materials to another location—she saw nothing except flattened sand. Batson set her kit on the side of the site, then jumped down the meter or so to the main part of the dig. He extended a hand to help her down, making her feel old. She was old, or at least older, than he was. She took his hand, let him ease her down, then grabbed the kit. From here she could see Disty prints, with their distinctive three-toed mark barely deep enough to be called an impression. Disty bones were hollow, and the Disty themselves weighed next to nothing. Batson walked in his original prints. He was a good detective, if a bit blunt and brash. She liked working on his cases because he actually cared. So many people on Sahara Dome’s Human Police Force didn’t. He walked almost to the center of the large excavated area, and then stopped. He crouched, and pointed with one dust-coated finger. She was probably dust-coated as well. Already she could taste the sand in the back of her mouth, grinding as she pressed her teeth together. Her eyes felt dry and gritty. Amazing how little of the dunes had to appear before they coated the entire area, even with the fantastic filtration system. She still didn’t see anything. The area near Batson’s finger was raised slightly, and nothing else. She crouched beside him, removing a paintbrush from her pocket. She had learned during her first year that any case involving Martian sand required a delicate tool for brushing it away. “What am I looking at?” she asked. His finger outlined the air above the sand. She squinted and finally saw what he was pointing at. Ridges, whirls, edges. She blinked twice to clear her mind, and looked again. Bone the same color as the sand, a dusty reddish-orange. She leaned forward, clutching her brush, and tried to rub off the sand. It came off in delicate chunks, floating to the side. But no matter how hard she dusted, she still couldn’t get all of the sand out of that bone. She pressed a button on her sleeve, starting a recording of the site. She probably should have started that when she arrived, but she hadn’t seen anything, and now she didn’t believe what she saw. Scott-Olson rested her brush on her knee, reached into her pocket, and pulled out the thinnest pair of gloves she owned. She still wanted to be able to feel through the material, but she didn’t want to contaminate the site any more than necessary. The gloves felt like rubber against her skin, then that feeling faded, replaced by a slight pulling sensation, as if the gloves made her middle-aged skin taut again. Slowly, she eased her hand down, and touched the innominate. It was hard, the surface clean. She had gotten all the dust off, and still the bone was reddish-orange, exactly the color of the soil. If the bone had been placed here recently, it should have been yellowish-white. She cleared dust away from the pelvis to find an intact sacrum, and a wide subpubic angle. From the look of this—and she was only going by gut at the moment—she was working on part of an adult female skeleton. Slowly, she worked around it, removing more sand with her brush, coming away from the bottom of the pelvis and toward her. It took very little digging to find the vertebrae, and slightly more to find the attached ribcage. She kept going upward, digging even deeper than she expected, until she found a skull near her feet. The eye sockets, empty except for sand, had sharp upper borders, confirming what she had already suspected. She was looking at a dead human woman. “Not many of them,” she said. “I remember,” Scott-Olson said, thinking mostly of that water, with the fat floating along the surface. The moisture and exceptionally warm temperature in the apartment had sped the decay. Strangely no one had reported the smell, which had to have been fierce, and by the time the body had been discovered—by the landlord, who thought his renter had skipped—the woman was long past bloated, little more than a skeleton, with flesh hanging off the bones. “Were they really screaming?” she asked, finally looking at him. The dust on his face had grown worse, almost a reddish mask over his skin. Her face probably looked the same. This stuff clung. “Disty found the body?” she asked. He brushed at his lower lip, making the dust layer worse. Protocol, she knew. Apparently, there were things in the Disty section not even the human police were allowed to see. Scott-Olson frowned, trying to imagine it. She’d never seen anyone on the Death Squad panic. “Maybe they did,” she said. “But no one would tell us why,” he said. “Except major contamination,” she said. “I suppose.” Scott-Olson brushed a bit more sand away from the skull. It had been buried deeper than the rest of the skeleton, almost as if it had been thrown halfway into a hole, legs on the edge, head inside. But the settling of two different buildings could have caused the same effect. “I don’t know why they’d lie.” She had stopped brushing again. Her knees ached. Her back ached too. Her own skeleton would probably show stress in those two areas, all because she had lived too long on Mars. She stood, stretched, and looked up, reveling in the empty air above her head. Her back cracked. “How long has this building been here?” she asked. He’d seen a number of those, just like she had, buried in the Martian soil, waiting for someone to find them. He frowned at her. Dust gathered in the fine lines around his eyes, accenting them. Batson let out a small sigh. She had an apartment with windows, high ceilings, and more floor space than half the apartments in Sahara Dome. It was a luxury place that she had bought back when prices were low and everyone thought the humans were going to leave Mars altogether. “Contaminating for years or decades,” he said. “The brass isn’t going to like this,” he said. “You know that?” he asked. She let out a sigh of impatience. Usually Batson wasn’t slow. Usually he had some compassion for the victim. He had no real idea. He’d never had a case that put him at odds with the Disty. She had. She had barely survived it. She wondered if she would survive this one, as well.